With just a few ingredients, you can make dip-heaven. Salsa can take any dish up a notch or three. Tomatoes are just a starting point for basic salsa. Later in this post, I’ll let you in on some secrets on how to use seasonal produce to make different types of salsa. Basically, I’m going to change your life. Yes, it is true. I love to dip things. I often choose a meal based on its “dipability”. Don’t judge! It’s one of my oddities….Ok many oddities, but people…it’s a party at every meal!!! And having a great basic salsa recipe is key for anyone to have tucked up their sleeve to pull out for impromptu events. Because this was my week to host for the Food Matters Project and because of my love for all things dip-able, I chose the easy fresh salsa recipe from Mark Bittman’s the Food Matters Cookbook. Paaaahrtay! 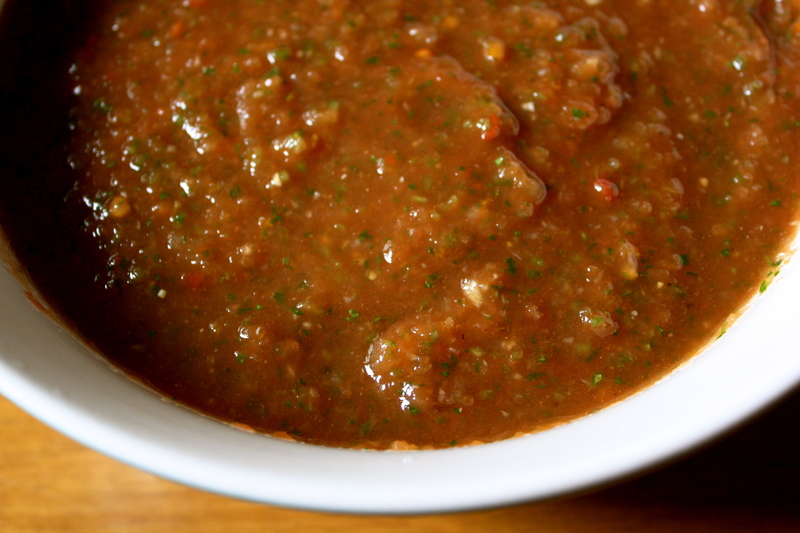 If you have never made fresh salsa, you are doing it today (or as soon as you can). Ya, I know you may have other crap planned, but guess what….salsa calls….”make me”. And it’s easy. Dip it or throw it on tacos, or a salad, or on a spoon. Fresh salsa is perfect party food (for my solo party) or perfect to bring along for such occasions as Cinco de Mayo or you can bring it to my house for me to dip! Garden tomatoes make the best salsa. But even when tomatoes are out of season, you can use canned tomatoes, which is what I did. Mark Bittman’s basic salsa is technically pico de gallo. I chose to puree the salsa since I used canned tomatoes and because I like the smooth consistency. However, you can leave it chunky, if you prefer. So let’s break it down. Really there are a few base ingredients that go into making salsa. 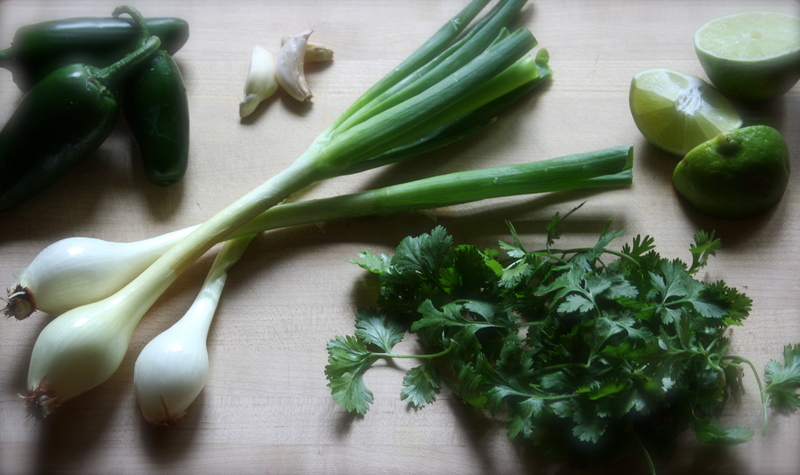 Onions + jalapeño + cilantro + lime juice (or any acidic juice really…vinegar works well too). From this basic formula, you can add several ingredients to make fresh salsa. Tomatoes are the basic salsa, of course. It will keep for up to a week in the fridge. But I doubt it will even linger that long. I used this salsa on top of eggs, on top of a spinach mushroom quesadilla (so dippable), and with homemade tortilla chips. 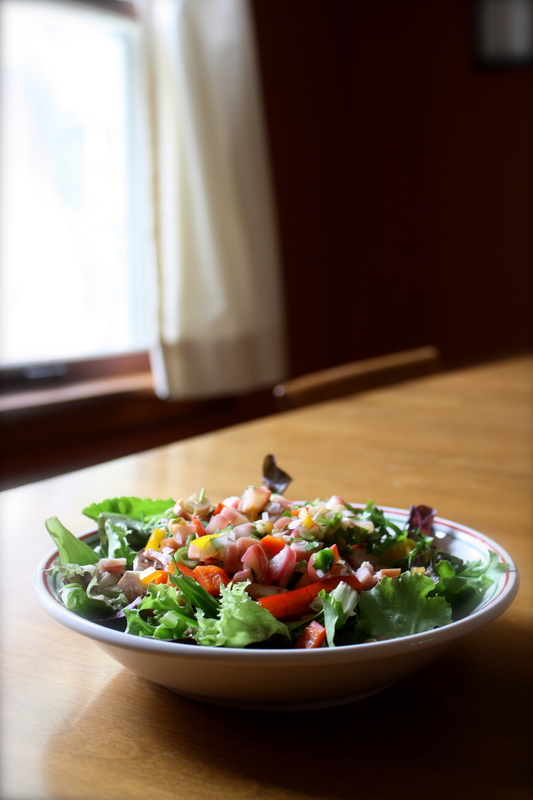 But, if you are feeling adventurous, there are other ingredients that you can add to salsa besides tomatoes….. such as seasonal fruit, black beans, or corn. With spring in full force, RHUBARB has finally flooded the farmers market!!!! 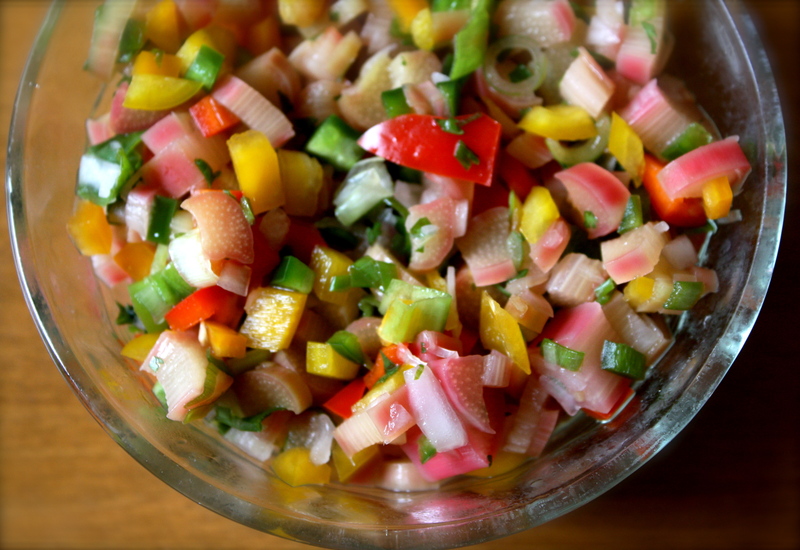 To take full advantage of rhubarb at its peak, I decided to also try to make a rhubarb salsa. I know, I know, I know…what about rhubarb pie, rhubarb tart? Just trust me and branch out from the sweet desserts. Rhubarb salsa beckons you. I was so impressed with the outcome. Using the basic salsa recipe as a starting point, I replaced the tomatoes with rhubarb and sweet bell pepper, and then added a tad bit of honey mixed with apple cider vinegar and lime juice. 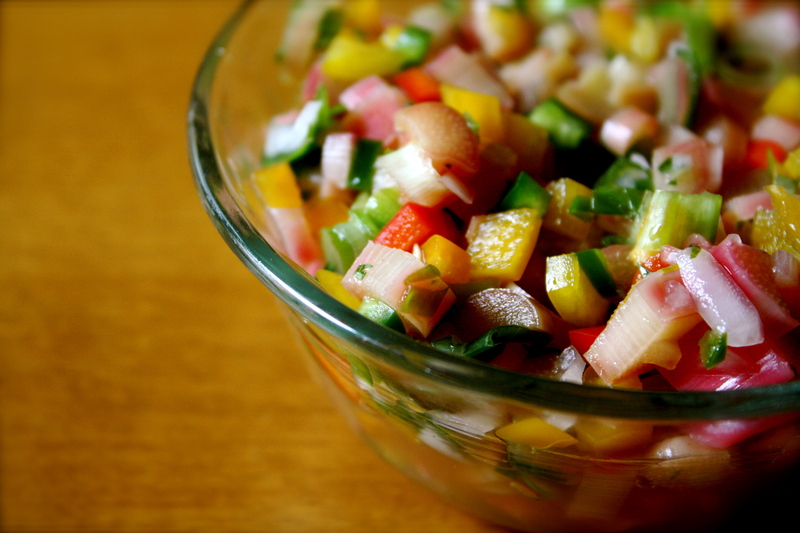 The tartness in the rhubarb salsa is balanced by the sweet honey and complimented by the spicy kick from the jalapeño. I ate this on fish tacos (so devine and sorry no pictures….they disappeared in my mouth). I also topped my fresh spring salad with it. Heavenly. In summer, swap out tomatoes for peaches or mangos. In the fall, use granny smith or any other tart variety of apples. You can also swap orange or lemon juice for the lime juice. Seriously, the options are endless when making salsa. After you make these salsa recipes, you are going to be in deep smit with them. You are welcome. Don’t forget to check out the other FMP bloggers creations! Combine all ingredients in a food processor. Puree until well combined. Taste and add salt/pepper. Chill covered for at least 30 minutes. Heat 2 cups of water in a saucepan to boiling. Blanch rhubarb by placing in the boiling water for 10 to 20 seconds. Quickly remove the rhubarb and place in a colander. Run cold water over the rhubarb to stop the cooking process. Blot the rhubarb with a paper towel to dry. 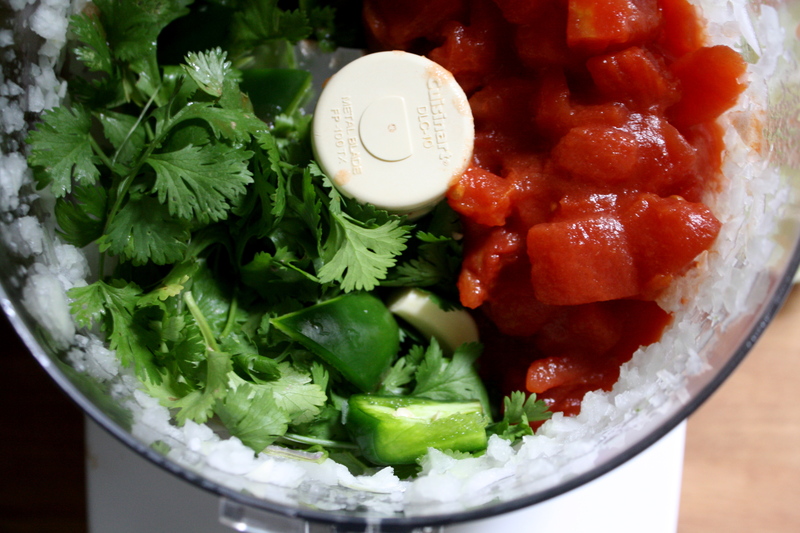 In a separate bowl, combine the bell pepper, onion, scallions, jalapeño, and cilantro. Add rhubarb and mix ingredients. In a small separate bowl, dissolve the honey in the lime juice and apple cider vinegar. Drizzle this dressing over the rhubarb salsa and stir. Add the salt and pepper. Mix well.